What is a "Scare Card" in poker? - Casino Answers! 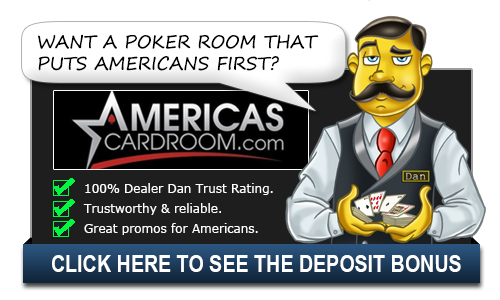 Casino Answers » Poker » Online Poker Beginner Q&A » What is a “Scare Card” in poker? What is a “Scare Card” in poker? A “scare card” is a card that, when it appears, brings forth a possibility for a better hand. In Texas Hold’em, a third suited card on the river is a scare card, because it makes a flush possible. Simply put a scare card is a card that scares a player off of putting more money into the pot. Scare cards can change a game significantly. If a player is playing aggressively and trying to take down the pot, but is unsuccessful then a scare card could force them out of the hand. That’s why they are called scare cards because they scare people. If your pretty sure your opponent paired a king on the flop, an ace on the turn is a scare card, because that lends the idea of a pair of aces beating that pair of kings. “Scare cards” will often make it difficult for the best hand to bet, and offer an opportunity for bluffing. The pair of kings player instantly loses their aggressiveness in the face of this ace and can perhaps give a bigger tell by doing this than they have previously gave away. Of course, you should also be aware of that if you are the one with the big hand that just got hit with a scare card. This is the time when your reading of players really comes in handy. If there is an Ace on the turn and your opponent is betting into it, why are they doing that? If they had an ace earlier, why didn’t they bet into you? Why are they only calling? Are they bluffing? Do they see the scare card and think that you have the kings so they are trying to use that information against you? These are the kind of questions that you need to ask yourself. Paying attention to what your opponent has done within this hand is important. Are they just bluffing or might they have it? If they have it, how have they played previous to this and does that prove anything? Poker is a constant study. You also, of course, need to be ready for the possibility of scare cards by always planning ahead. You have a pair of kings on the flop, right? Well, how were you betting before the turn? Did your bets encourage others to stay in the hand? Should they have. You know that scare cards exist and you need to make sure that you put yourself in a situation to succeed despite of them. Always have a plan and always be looking ahead. Scare cards are a part of the game and understanding them is important. Sometimes they just scare you out of putting more money in the pot when you probably should. Other times they can get you right out of hand. Having awareness to what’s going on, understanding scare cards and knowing what your opponent is doing is all part of becoming a long term successful poker player.